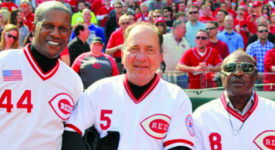 Adam Dunn, Fred Norman and Dave Bristol earned spot in Reds Hall of Fame. The requirements to make it to the Reds Hall of Fame verses the Major League Baseball Hall of Fame are a tad different. It’s kind of like proof in a civil trial verses a criminal trial. The burden of proof is much less in a civil trial. Neither Adam Dunn, Fred Norman nor Dave Bristol are threats to be inducted into the MLB hall of fame. That does not mean their careers are not worth honoring. Dunn was one of the most notorious power hitters in Reds history. In the early 2000’s he cracked 40 or more home runs five seasons in a row. When you have big power hitters who put up power and RBI numbers you usually have to deal with strikeouts and low batting averages along with that. Dunn was amongst the leaders in strikeouts in his years with the Reds. He ended his career with a batting average of .237. Dunn was never on a Reds playoff team. 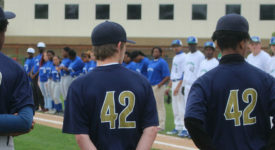 He remained very popular with fans and his teammates long after he departed in 2008. He would go on to play for Arizona, Washington, Chicago White Sox and Oakland before his career would finally come to an end. Many people have compared modern day Reds slugger Adam Duvall to Dunn. Before Dunn was hitting tape-measure home runs in GABP in the early 2000’s, Fred Norman was helping the Big Red Machine to win back-to-back titles in the mid 1970’s. In a career that started in 1962, Norman proved himself one of the most durable pitchers the Reds have ever seen. He would finally get to take his talents to Cincinnati in 1973. He would get to pitch for the Reds for seven seasons, while helping the team win back-to-back World Series titles in 1975 and 1976. Norman was part of a solid Reds rotation in those championship seasons. In 1975, Norman would go 12-4, following that with a 12-7 campaign in 1975. Both seasons he would post ERAs of less then 4. By 1979, Norman had seen his better days. He would end his career with the Montreal Expos in 1980. Before Norman was trying to get batters out for the Reds, Dave Bristol was trying to manage the Reds to wins. It was during Bristol’s tenure as Reds manager from 1966 t0 1969 some of the Reds’ Big Red Machine parts like Perez and Bench were starting to come into play. Unfortunately for Bristol, his managing employment for the Reds would end before a decade of dominance led by Sparky Anderson. Bristol would go on to manage the Milwaukee Brewers, Atlanta Braves and San Francisco Giants before his managing career would finally end. It’s just fitting the Reds would honor the pre-Reds Machine manager, giving him his just due.